The idea behind the patient gamer category was originally to review Xbox Live “Games with Gold” but I have trouble following guidelines. Plus, not only does a gold membership give you access to free games, it also allows you to have a free play weekend. You can download a full game, give it a try for the weekend, and then determine if you really want to buy it the following week. For me, this is a terrible trap to which I am constantly trying not to fall. A couple of months ago, I saw that NBA2K17 was available for a free weekend trial. I downloaded it on a Friday and, by Sunday, I had already played through a full season with my beloved Philadelphia 76ers. Since it is one of the few places you will actually see the Sixers win a game recently, I was immediately drawn in. By Monday, I loaded the game and was in shock when it took me to the Xbox Store to prompt me for purchase. After reluctantly forking over $60, I spent the next couple months weighing my decision. I’ll try to break down some of my thoughts into pros and cons and we can all decide for ourselves the quality of this purchase. Overall graphics and attention to detail – After taking a few years off from sports games, I was pleasantly surprised by the realism and beauty of this game. The arenas are well done with realistic looking crowds, courts and scoreboards. This may seem like a petty observation but there were many times that friends or family couldn’t tell whether I was playing NBA2K17 or watching a live basketball game.The player models were also very well done with each player having their own unique look and playing style. The details, even down to their exact shooting form, was captured perfectly for most players. It’s fun to randomly pull up an exhibition game between some retro teams and watch Magic Johnson dribble around with exaggerated high knees or Larry Bird hitting threes with his arms raised well above his head on release. Draymond Green works up a sweat punching guys in the junk. Control modes – Often times when you play a sports game, the buttons take a 9 week course to master most of them. In this game for every control, there is a simple or complex button choice. For instance to shoot the ball, you can either hold down the X button or use the stick. The stick gives you more control but is harder to get the hang of than just a simple button click. This was appealing to me because while I was trying to get the hang of more complex button combinations, I was able to still use the simple controls to get by. It wasn’t like some games (UFC, WWE, etc) where until you get a firm understanding of the exact combinations you are going to get throttled, repeatedly. Career mode – Outside of just your standard play now modes, there are some other pretty interesting game modes. I’m usually not a big fan of online modes, so when I play games like this I am usually looking to sink time into modes that don’t force me into online play (this will be covered in more detail in future con items, I assure you) without a decent local play mode. Career mode allows you to create your own character and starting with a couple college games, character build to your heart’s content.It also has a neat feature that allows you to take pictures with your smartphone and upload them to your career mode. It takes your selfies and models them around your player model. When you have a face like this, who wouldn’t want to look at it as much as possible. 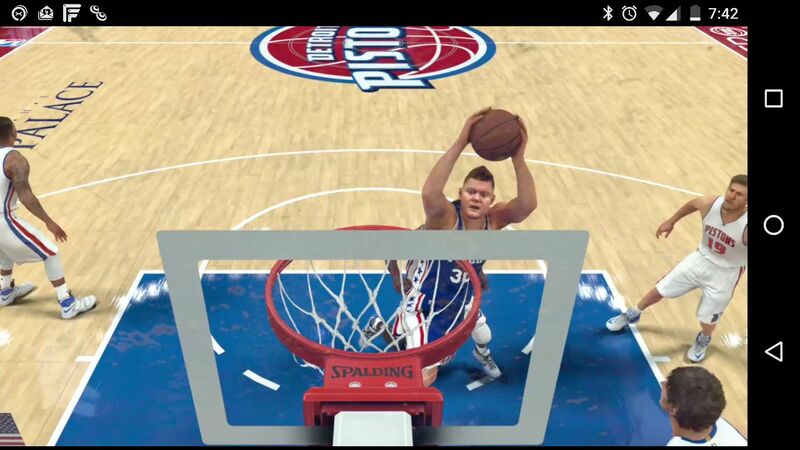 Career mode allows you to take control of the day to day life of an NBA player. You start with a generic player model and design everything about them. You choose your position and what type of player you want to be. As you play games, you are rewarded with points for how well you do. You take the points and redeem them for leveling up different aspects of your player’s game. There are several abilities, like free throw shooting, that you can only level up through practice. During the day, there are periods of time where the gym is open and you can go practice. You can work on your shot or as other NPC’s come and go in the gym, play pickup games. The experience earned in practices allows you to improve on things you couldn’t otherwise do by buying skill levels.As you play through the season, you can receive player awards, participate in all-star games, or attract new fans by hanging out with past and present NBA players. For gamers with a thing for leveling up characters, this would be your mode. Endless loading screens – As in most other sports games, NBA2K17 is made up of about 78% loading screens. When you turn on the game, the initial splash screen is discreetly a loading screen. You can skip the intro video, which will then drop you to the main menu screen and another progress bar. I think at this point behind this loading screen it’s going out to 2k servers to check for updates. When that finishes, you will probably be awoken from your slumber by horribly loud hip hop music. This is your cue to choose the menu that will advance you to your next loading screen. If you choose an offline mode of gameplay, the update it previously was searching for will be downloaded at your next convenient load screen.Let’s say you want to play career mode and blow off some steam. To get to an actual game play (you know, the actual point of turning the game on), you have to wait through two additional load screens and an additional load screen disguised as a pregame show to get there. If you are counting at home, that’s a total of 5-6 load screens to get to actual game play in career mode. You sit down, turn on your Xbox to play a little basketball and before you know it, it’s baseball season. 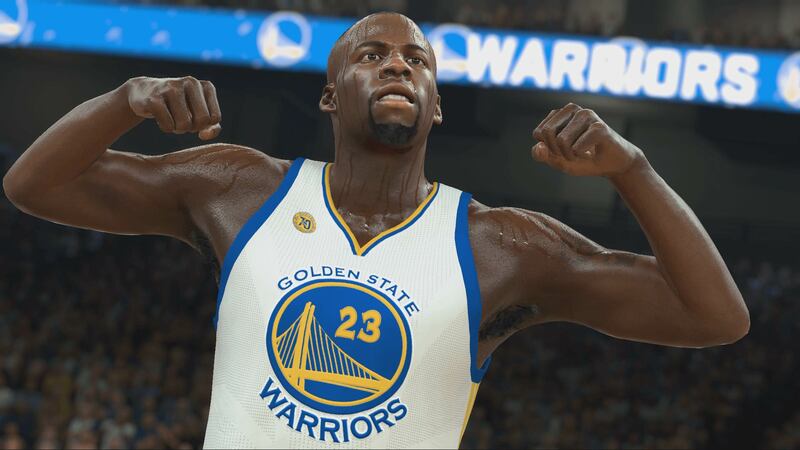 Updates – As previously mentioned, 2k is thrilled to pump out daily updates for this game. This would please most online gamers, but for me, it’s just one more thing to wait on in a loading screen that I have yet to see a return on investment with. The updates won’t attempt to download unless you are in an offline game mode. This means that if you bring up play now, GM or season mode, you are going to have an extra long wait time at your initial load screen whether you want the update or not.Another fun benefit of the daily updates being pushed down your throat is the game often time gets confused and the update will hang the game at unexpected points with no notice whatsoever.My favorite of these is when it occurs at the initial game launch. You load the game up, some sweet hip hop music greets you and it plays a beautiful video of your favorite stars. Without warning, Chris Paul stops moving and the music stops. There are no error messages and no indication that the game is still alive. 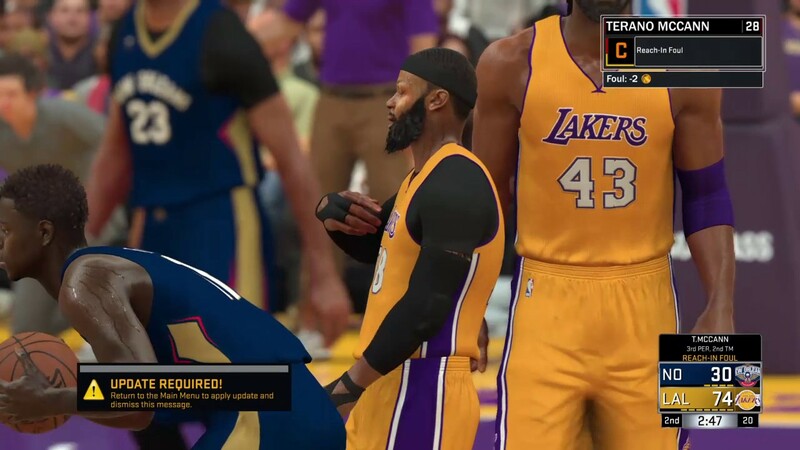 You can attempt to resuscitate it by launching the game again but 2k is persistent. They want you to have this update, no matter the cost. When this fun issue arises, the only way that I’ve been able to resolve it is to clear the reserved game cache for NBA2K17 on the console. This forces it to pull down the latest version (with a longer than usual load screen) and install fresh. Try googling the phrase “NBA2K17 freezes” to see how big of an issue this is for users.Any game developer that can’t even properly push out an update without requiring its users to basically clear the game’s cache manually prior to updating doesn’t deserve my money. Get used to playing games with this banner unless you want to quit everything you are doing and drop back to the main menu to install your daily update. Feeling alienated – I realize that the NBA has doubled down on targeting a younger market to which demographically I don’t belong for several reasons. To say this in the nicest way possible, I don’t really care much for hip hop or rap music. I’m not much of a fan of street ball either. Does that mean I can’t be a fan of NBA basketball now? Why is it not in the NBA’s and 2K’s best interest to open their doors to fans from all walks of life?I guess I’m just a little disgruntled as a 33 year old, un-athletic, lifelong video game player and fan of the NBA, to so obviously be the antithesis of this games’ target audience. Oh, and get off my lawn while you’re at it! If your score is greater than zero, you’ll probably enjoy this game. My score is a sweet -13 by the way. Oh, and don’t make me tell you to get off my lawn again! This entry was posted in Games With Gold, Reviews, Video Games and tagged The Patient Gamer. Bookmark the permalink.